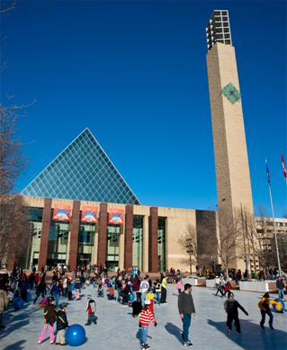 Celebrate Family Day in City Hall and Sir Winston Churchill Square with free family fun. Take a twirl on the City Hall ice rink, go for a hay ride, roast bannock over an open fire and check out the Family Day games and activities on the Square. Free skate and helmet rentals will be available on a first-come, first-served basis. Food trucks will be on site. The excitement continues inside City Hall with live entertainment, crafts and more! Please note: Skating may be cancelled in the event of poor ice conditions or severe weather. Call 311 for the most up-to-date information. Fun-filled family events and activities at City facilities. Enjoy Family Day at the Alberta Legislature with entertainment, a scavenger hunt, carnival games, crafts, wagon rides and lots of indoor and outdoor activities. The City of Edmonton maintains toboggan hills at several locations with safe run-outs, safety signs and reduced hazards. Skating outdoors is fun for the whole family. Check rink locations, hours & amenities.